You want to get married in paradise, you have the time to organise your wedding but need some practical assistance and advice to achieve your dreams. Tell us your requirements, give us an indication of your budget and expectations and let Dragonfly Weddings and Events do the rest. Our relationships with suppliers, from venues, florists and entertainment to catering and set-up, makes your hands-on wedding planning experience a pleasure. Providing advice to achieve your objectives. Supplying you with a comprehensive document with different options/quotes and my suggested suppliers to book and their contact details. For those who have already done the planning process and have made many of their bookings but want to have someone on hand to ensure all details are taken care of in the lead up to the wedding and be there on your special day. 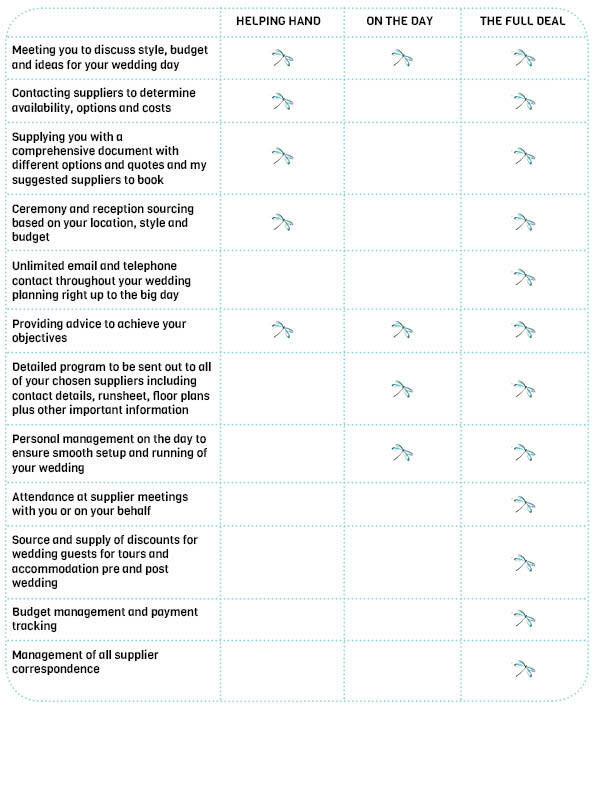 Supplier recommendations for any remaining bookings to be confirmed. Meeting you to discuss style, budget and ideas for your wedding day. Detailed program to be sent to all of your chosen suppliers, including contact details, run sheets, floor layouts, transfer details, music and photography directives, menu information and anything else we think is important. This makes it much easier on the day when everyone is working from the same document. Personal management on the day to ensure the smooth running of your wedding. We’ll be there for you on the day to co-ordinate all of your suppliers, make sure everything is happening to plan and sort out any little details that inevitably crop up! It’s your day, your choice, we’ll take care of the details. For the busy couple who do not have the time (or just don’t want) to organise their dream wedding from scratch! I will be there with you every step of the way taking care of each and every detail, handling all wedding administration requirements like setting and confirming appointments, attending supplier meetings with you or on your behalf, budget management and payment tracking as well as managing all supplier correspondence for you. Or we can tailor a package to suit as every couple and every wedding is different!